Director Terry Gilliam and an all-star cast, including John Neville, Eric Idle, Oliver Reedand, and Uma Thurman, deliver this tale of the enchanting adventures of Baron von Munchausen on his journey to save a town from defeat. Being swallowed by a giant sea-monster, a trip to the moon, a dance with Venus and an escape from the Grim Reaper are only some of the improbable adventures. Terry Gilliam seriously tempted fate with Brazil, his 1985 masterwork that endangered his career potential. However, on that film, he fought the law and he won. While Brazil didn't exactly rake in the bucks, it did respectably, earned some well-deserved critic kudos, and still enjoys continued standing as a minor classic. Not so much for Gilliam's follow-up film, 1989's The Adventures of Baron Munchausen. Again Gilliam went over budget, though this time he apparently managed to avoid antagonizing the studio heads. Still, much of history repeated itself, except for the happy ending of the film’s legacy. Munchausen went on to little fame and no fortune. It died a quiet box office death and remains somewhat obscure in the shadow of Brazil. Which, to be honest, makes some sense when I compare the flicks. Brazil was brilliant, wildly pointed and imaginative. Munchausen shows signs of sparks at times, but overall I think it is mainly a fun diversion, as it lacks the social commentary and wit of Brazil. Oh, to be sure, Gilliam gets off his usual salvos at bureaucrats, and he definitely displays his own worldview by having an old man teach a child to be less stuffy, but Munchausen lacks the impact and clarity of Brazil. Set in an unnamed European city in the late 18th century, the Turks maintain a continued siege on the town. While this occurs, a theatrical troupe performs the tales of Baron Munchausen. In the midst of this show, however, a man who claims to be the real Baron (John Neville) interrupts. He bemoans the inaccuracy of this rendition and attempts to set the record straight with the truth of how his conflict with the Turkish Sultan (Peter Jeffrey) started the never-ending war. Another assault from the Turks ends Munchausen’s oration and leaves him near death. The troupe leader’s daughter Sally (Sarah Polley) revives Munchausen and he eventually agrees to resolve the situation. The film follows Munchausen’s adventures along with Sally and the members of his old gang. Rather than Brazil, Munchausen more strongly recalls 1981's Gilliam effort Time Bandits. Both offer loosely connected scenes that make up a flimsy plot, but both overcome that problem through whimsy and fantasy. I find Munchausen to be more consistent than Bandits; the latter begins very strongly but peters out somewhat about a third of the way through the film. Munchausen doesn't quite equal some of the wonderful highs of Bandits, but it also avoids that film's lows. The movie offers consistent fun and adventure, but still lacks any real sense of spark. While I like Munchausen, it just never captures my imagination like I feel it should. I'll definitely watch it again, though, and find it to be a good movie; it's only a disappointment when one considers the potential talent of Gilliam. 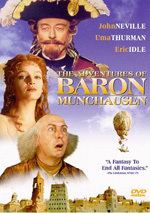 The Adventures of Baron Munchausen appears in both an aspect ratio of approximately 1.85:1 and in a fullscreen version on this single-sided, double-layered DVD; the widescreen image has been enhanced for 16X9 televisions. Only the letterboxed picture was reviewed for this article. This was an acceptable but unexceptional transfer. The biggest visual problems were likely unavoidable due to the nature of the production. Munchausen used a lot of effects shots that added a fair amount of grain to the presentation. We also saw quite a bit of smoke in the battle scenes, a factor that exacerbated the inherent graininess. That side of things could make the image a bit murky and rough at times, but again, I don’t think that the transfer could get around those issues since they resulted from the original photography. Other than the graininess, the presentation was generally good. Sharpness usually appeared solid. Softness occasionally marred some wide shots, but the majority of the flick looked fairly crisp and concise. No issues with jagged edges or shimmering occurred, but I noticed mild edge enhancement at times. In addition, a smattering of print flaws materialized. Occasional specks and marks cropped up, though these weren’t too problematic. Gilliam imbued the film with a nice golden tone, and the image seemed rich and lush. Colors looked fairly bold and vivid throughout the movie, though skin tones were too ruddy at times. Black levels seemed deep and strong, and shadow detail appeared decent, though a few low-light shots were a bit murky. Ultimately, the image was inconsistent but good enough for a “B-“. The film's Dolby Surround 2.0 soundtrack was decent but not great. It presented a mildly effective soundstage, with a definite emphasis on the front. The forward range offered some acceptable stereo imaging; the audio tended toward the center, but a fair amount of sound emanated from the right and left speakers. Those elements didn’t bring a lot of life to the proceedings, but they managed to contribute some zip in the action scenes. Music offered fair stereo delineation, but lines occasionally suffered from some bleeding to the sides. The surrounds didn’t have a lot to do here. They seemed passive much of the time and only sporadically made themselves known. A few louder scenes brought out reasonably engaging material from the rear speakers, but don’t expect much from them. Audio quality appeared dated but acceptable. Though dialogue could be a bit thin, the lines remained intelligible and without much edginess. Music was a mixed bag. Some score elements occasionally boasted decent bass, but the music usually lacked much of a robust nature. The same went for the effects. At times they demonstrated nice life, but on many other occasions they were weak and somewhat feeble. Matters did seem to improve as the film progressed; I thought the audio appeared more impressive during the flick’s second half. Nonetheless, this was a mix of relative highs and lows that ended up with a “B-“ given its vintage. Less satisfactory is the supplemental section of this DVD. All we get here are a fun trailer and biographies/filmographies for Gilliam and Eric Idle. Both bios are pretty good, but we should have heard about more of the cast. The DVD's booklet contains three paragraphs of information about the production as well. Ultimately, The Adventures of Baron Munchausen receives a very mild recommendation from me. I like the film, though I thought it doesn’t live up to the highs of some previous works from Terry Gilliam. The DVD looks and sounds fairly good, though it lacks substantial extras. The movie was creative and fun and will definitely receive additional screenings in the future, so it's something you should give a look despite the ordinary nature of this DVD.